Subscribe to DVHH-L email list. 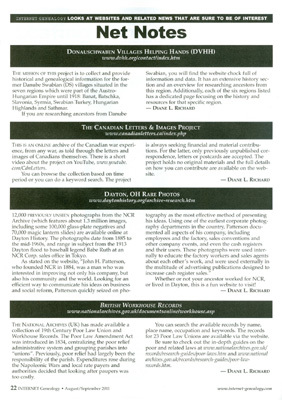 Aug/Sep 2011 Issue - The DVHH is mentioned under "Net Notes"
Greetings DVHH Members, Volunteers and List Subscribers! I am pleased to inform you that by virtue of pure coincidence, I recently had the privilege and good fortune to meet the publisher and editor of "Internet Genealogy" magazine, Mr. Edward Zapletal. Mr. Zapletal has been kind enough to mention the DVHH website in the "Net Notes" section of the upcoming August/September 2011 issue. 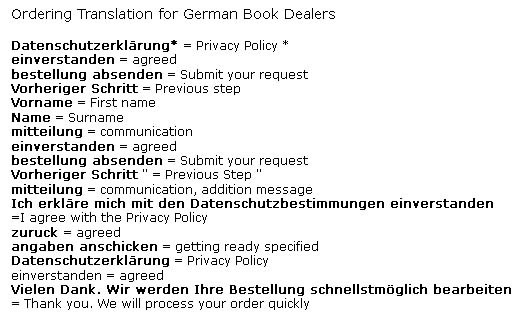 The mini article is the first one which appears in the notes and it describes our website accurately and concisely. Better still, Mr. Zapletal has indicated that there are plans for a full-page story about the DVHH in a future issue! The magazine is also available at "Borders, Barnes & Noble" and "Books-A-Million" in the U.S. and at "Chapters" in Canada. The Aug./Sept. 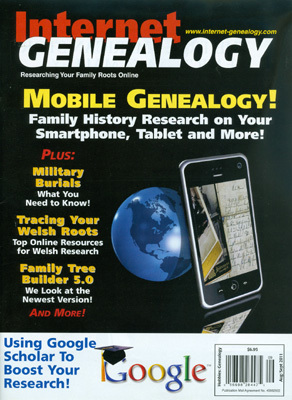 2011 issue also includes a free CD of software version 5.0 of "My Heritage Family Tree Builder".